Urban Archeologist: So, how do you land the B-24 with the landing gear damaged? So, how do you land the B-24 with the landing gear damaged? I can't get enough of old paper. 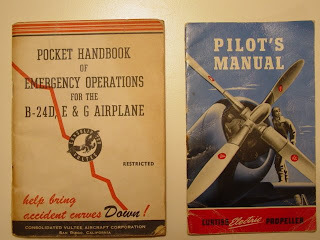 These manuals for the "B-24" series bombers and the Curtis electric propeller are a good example. I found these in Bridgewater, and in the back of one are notes one of the flight crew made (mainly what to pack for a mission). I would have just as much liked to have spoken with the owner of these to get a little provenance. You'll need to click on the image for the larger image.